Options and Instruments for a Deep Cut in CO2 Emissions: Carbon Dioxide Capture or Renewables, Taxes or Subsidies? This paper compares both the main physical options and the principal policy instruments to realize a deep cut in carbon dioxide emissions necessary to control global climate change. A top-down energy-economy model is used that has three emission reduction options: energy savings, a transition towards less carbon-intensive or non-carbon energy resources, and the use of carbon dioxide capture and storage technology. 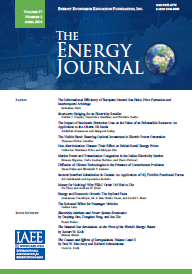 Five policy instruments - carbon taxes, fossil fuel taxes, non-carbon (renewable) energy subsidies, a portfolio standard for the carbon intensity of energy production, and a portfolio standard for the use of non-carbon (renewable) energy resources - are compared in terms of costs, efficiency and their impact on the composition of the energy supply system. One of our main conclusions is that a carbon intensity portfolio standard, involving the recycling of carbon taxes to support renewables deployment, is the most cost-efficient way to address the problem of global climate change. A comprehensive introduction of the capture and storage of carbon dioxide would contribute to reducing the costs of climate change control, but would not obviate the large-scale need for renewables.